Pharmacy employees form a key part of today’s healthcare system. Safely handling medications, filling and pricing prescriptions for customers, managing inventory – these are just some of the many rewarding tasks associated with a pharmacy technician career. Online pharmacy technician schools prepare students to fulfill the essential job responsibilities, from assisting the pharmacist with preparing prescriptions to helping customers and patients. Read on to learn about online program options available as well as how to plan and prepare for a career in this exciting field. Pharmacy technicians are a key element of the health care environment and are continually in demand. Aspiring pharmacy techs can now earn their degree online, giving them the flexibility they need to advance their careers while not sacrificing other areas of their lives. Graduates of these programs ensure patients receive the care and attention they need and the correct medication to take care of their health. There are several types of online pharmacy schools from which to choose, and students must do their research to find the right school for them. We’ve provided our research here to get you started. Founded in 1923, as the Iola Junior College, today’s Allen County Community College currently serves 2,500 students through campus-based programs in Iola and Burlingame and distance education programs on interactive television and through the internet. The college’s Associate in Applied Science in Pharmacy Technician program is offered on campus but includes three online courses. The 60-credit degree includes training in pharmacology, calculations, nutrition, mathematics, business communications, and pharmacy operations. Students undertake an optional Pharmacy Technician Internship in their final semester. Graduates can choose to transfer to a Kansas public university to complete a four-year degree. North Central Missouri College, formerly Trenton Junior College, was founded in 1925. It opened the Barton Farm Campus in 2011 and has satellite campuses in Bethany and Mayville. Today it enrolls 1,458 students. The two-year Pharmacy Technician program is offered on campus or online, with online students taking compulsory labs on campus. The 60-credit program includes one summer of classes and an eight-week supervised internship in a professional setting. First-semester studies ground the students in computer skills, anatomy, and basic medical terminology. Core pharmacy courses are offered only during the Spring semester. A member of the Community Colleges of Spokane, Spokane Community College was established in 1963. Today it offers degree and career education programs to 9,100 students. Credits from its associate degree programs can be transferred to many of Washington State’s public and private four-year institutions. The Pharmacy Technician Program at SCC can be completed in three quarters through a curriculum that blends classroom studies, laboratory practice, and clinical training. Students are required to complete 176 clinical hours in community and home health care settings. After completing the program, students can sit for national certification examinations for licensing by the Washington Quality Assurance Commission. Established in 2003, Minnesota State Community and Technical College offers programs at Moorhead, Detroit Lakes, Wadena, and Fergus Falls campuses as well as through 25 eCampus online degree programs. Its Pharmacy Technology programs include a 36-credit diploma and 60-credit AAS degree. Accredited by American Society of Health-Systems Pharmacists, the M State program is comprised of didactic courses online and in-person clinical/lab coursework on the Wadena campus. Required coursework includes studies in computer operation, human anatomy and physiology, chemistry and microbiology. Core courses include Fundamental Concepts of Pharmacy, Drug Properties/Distribution, Pharmacy Principles/Practicum, Experiential/Hospital and Experiential/Retail pharmacy. Pharmacy technicians may choose from several career options after earning an online education. They all require a minimum of a career diploma or associate degree, but may not require certification since regulations vary between states. According to the Bureau of Labor Statistics, certification can make it easier for pharmacy technicians to find employment. Take a look at some career options with salary and education requirements below. The Bureau of Labor Statistics reports that 52 percent of pharmacy technicians in the U.S. worked in pharmacies and drug stores, while 13 percent found employment in private hospitals in 2014. Drug stores and pharmacies can be a very busy working environment with many responsibilities, including greeting customers, entering their prescription information into the computer, measuring medications, and accepting payment. Pharmacy technicians need to be able to prioritize and manage tasks well because they also need to answer calls from customers and health care providers as they come in. Those working in private hospitals fulfill many similar job responsibilities, working under the supervision of a licensed pharmacist as they enter orders and fill prescriptions for inpatients and patients soon to be discharged. Hospital pharmacy technicians prepare a wider variety of medications because of the different health needs of the patients they service. In some states, pharmacy technicians are permitted to compound medications under the supervision of a licensed pharmacist. Being detail oriented is essential to prevent prescription mistakes. The BLS projects a growth of 9 percent in the employment of pharmacy technicians from 2014 to 2024, faster than the average for all occupations. Reasons for the expected growth include an aging population requiring more prescriptions and increased health care coverage making it possible for people to pay for medication. Pharmacy assistants provide the most basic levels of service in a pharmacy. Although they assist pharmacists along with pharmacy technicians, pharmacy assistants do not have the same level of training and education. The primary responsibility of a pharmacy assistant is check people out at the cash register and provide customer service assistance so pharmacy technicians can handle other duties. Job growth for pharmacy assistants is projected to be 3 percent from 2014 to 2024 according to the BLS. Lead pharmacy technicians handle the same responsibilities as other pharmacy technicians while also providing leadership and guidance, monitoring workflow and billing activities. In addition to preparing medications and dispensing them into bottles, lead pharmacy technicians are responsible for selecting and stocking medications and supplies in the pharmacy. Busy pharmacies often require lead pharmacy technicians to take on more of the pharmacist’s responsibilities in order to free them up to handle tasks that require advanced training. Pharmacists are licensed to prepare and dispense prescription medication to patients. They also advise patients about how to use their prescriptions safely. Pharmacists must earn a four-year Doctor of Pharmacy (Pharm.D.) degree and pass two licensing exams in order to practice. They are responsible for record-keeping and administrative tasks and overseeing the pharmacy technicians. The national job growth outlook for pharmacists is 3 percent from 2014 to 2024 according to the BLS, slower than average for all occupations. An increase in the number pharmacy school graduates has resulted in more competition for jobs. Earning an associate’s degree is a significant accomplishment for someone pursuing a career as a pharmacy technician, but it is just one of many. The map below identifies potential milestones a pharmacy technician might accomplish while working in the profession. One of the benefits of an online pharmacy technician education is having the flexibility to continue meeting work and personal responsibilities while learning an important vocation at the same time. Most online pharmacy technician schools offer similar courses as traditional campus programs, so students can be confident that they are learning all of the necessary skills to thrive in the pharmaceutical industry. Students enrolled in online pharmacy technician programs often work at their own pace. Online tutors are available when needed to help students digest the material covered in their classes and virtual labs. Examples of how multimedia is used for instruction in a virtual setting include videos, digital study guides, online lectures, and webinars. Students also have 24/7 access to lessons, assignments, and online peer discussion forums. Completing an externship is a significant component of many online pharmacy technician programs. Institutions often partner with retail pharmacy chains around the country to provide externship opportunities. If students do not live close to a participating pharmacy, they can arrange a substitute externship or enroll in a virtual internship. Online pharmacy technician schools offer several types of programs to meet the different needs of their students. It’s helpful for prospective students to understand all of the types of programs available to ensure they choose the option that supports them in their personal career journey. The three most common program options are a career diploma, associate degree, and continuing education program. Vocational schools and community colleges offer online career diplomas that can be completed in a year or less. These private institutions specialize in preparing students to enter the workforce by providing the necessary training and credentials. Community colleges are public institutions, and generally less expensive for in-state students. Students enrolled in pharmacy technician career diploma programs learn to manage and update patient records, understand medical terminology, and assist pharmacists with office duties. Specific program requirements vary depending on the type of institution and program, but pharmacy technician career diploma programs generally include a combination of curriculum hours and supervised training by a licensed pharmacist. Externships may be offered at community hospitals or local retail pharmacies. Most career diploma programs take up to a year to complete and consist of 18 to 50 credit hours. However, accelerated programs allow students to graduate in as little as three months by studying full-time. Although the time it takes students to graduate depends on the amount of time they can put in, online pharmacy technician diploma programs at accredited online schools meet or exceed the training requisites for both the PTCB and NHA exams. In addition to offering diploma programs, career schools and community colleges also offer pharmacy technician associate degree programs to prepare students for careers as pharmacy technicians. Associate degree programs include general education courses not found in diploma programs. Community college tuition is less expensive for in-state residents and may be a better financial option. However, tuition differs among programs, so it’s important to research costs before deciding on a program. Associate degree programs are comprised of 90 credit hours of general education and pharmacy technician courses. In some cases, students need to meet math or science prerequisites before beginning their associate degree education, so prospective students should find out what is expected ahead of time. Online pharmacy technician programs include subjects such as Pharmacy Law, Pharmacy Calculations, and Pharmacy Records Management, among others. Students are also required to complete an externship so they can handle responsibilities in a pharmacy setting after graduation. Pharmacy technician associate degrees from accredited institutions meet or exceed the PTCB and NHA certification exam requirements—just like career diplomas. However, some employers prefer employees to hold a degree. Continuing pharmacy education (CPE) ensures that pharmacy technicians maintain competency and improve their professional skills. Since most states require pharmacy technicians to be certified, CPE is also necessary to renew certification. Each State Board determines the requirements for certification or license renewal. For instance, the Florida Board of Pharmacy requires pharmacy technicians to renew their licenses 12 months from initial licensure after completing 9 general hours of CPE, 1 hour of HIV/AIDS CPE, and 2 hours of medical CPE. New licensees in California are exempt from the first cycle of renewal. However, 30 hours of CPE must then be completed every two years for renewal. The National Association of Boards of Pharmacy (NAPB) and the ACPE provide a simple way for pharmacy technicians to keep track of their CPE through CPE Monitor. After setting up a profile, users receive an e-Profile ID to be submitted along with their birth date when registering for CPE courses. Providers automatically transmit claims to ACPE, who in turn transmit it to NABP. As certification renewal requirements have increased over the past decade, ACPE-providers have begun to offer many CPE courses online for pharmacy technicians. A searchable database of CPE providers is available at the Accreditation Council for Pharmacy Education (ACPE) website. Practical pharmacology knowledge, including mechanisms of drug interactions, indications and contraindications, and side effects relating to the cardiovascular, endocrine, gastrointestinal, muscular, nervous, and respiratory systems. Skills needed to interpret, prepare, label, and maintain records of physicians’ medication orders and prescriptions in a community pharmacy setting. Topics include prescription calculations, count and pour techniques, and customer service. Investigation of the Federal and State laws that govern pharmacies. The course also addresses principles of ethical thought as well as how to follow proper ethical practices. The fundamentals of pharmaceutical measurement and the mathematics encountered in pharmaceutical practice. Instruction in the professional attitudes, judgments, and technical skills to function as pharmacy technicians in the community setting. This course provides active participation in daily operations. 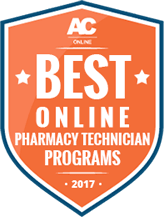 Deciding on an online pharmacy technician program can be challenging because of the many programs available. Here are some factors to consider when choosing an online pharmacy technician school. Decide which type of online program suits your career goals as a future pharmacy technician (diploma or associate degree) and has a start date that works for your schedule. Make sure you meet admission and other academic requirements such as GPA score or placement tests. Find out if the online school prepares students for the Pharmacy Technician Certification Exam (PTCE) and meets the requirements of the State Board of Pharmacy in your state. Is the agency accredited by the Accreditation Council for Pharmacy Education, the American Society of Health-System Pharmacists Commission on Credentialing, or another accrediting agency? Examine support services available to online students such as career services, technology assistance, or on-campus support. Ensure tuition costs are realistic and look into financial aid options for online pharmacy technician students. Before choosing an online program for pharmacy technicians, it’s important to check its accreditation status. Schools receive accreditation after completing an optional, extensive process to evaluate the program’s qualifications. Employers may be skeptical about hiring pharmacy technicians who did not graduate from an accredited institution. In addition, graduates from accredited institutions can be assured they will get the full benefits of their online pharmacy technician education. The following certifications apply to online pharmacy technician programs. The Accreditation Council for Pharmacy Education (ACPE) is the national agency that accredits professional degree program for pharmacists, as well as continuing education program providers for pharmacists and pharmacy technicians. The ASHP Commission on Credentialing (COC) accredits both pharmacy technician training programs and pharmacy residency programs that are postgraduate training programs for pharmacists. The Distance Education Accrediting Commission (DEAC) accredits higher learning institutions and postsecondary institutions that offer certificates or diplomas, and postsecondary institutions that offer associate’s, bachelor’s and master’s degrees, in programs designed to educate students for professional, technical or occupational careers including those that offer those programs via distance education or internationally. Students can ensure they are ready to earn their online pharmacy technician associate degree by completing required tasks on a schedule. Following a timeline or calendar of important dates can be helpful to keep students on track and eliminate the risk of missing crucial deadlines. The chart below is an example of an enrollment timeline for a pharmacy technician online associate of applied science degree. Register as a Technician Trainee with the State Board, if necessary. This may include a background check and fingerprinting. Complete FAFSA®, apply for financial aid and secure applicable grants, loans, and scholarships. In addition to the above steps, there are additional ways students can begin to prepare for an online pharmacy technician education—as well as actions they can take even after they have begun to work in the field. Join a professional organization or club such as the National Pharmacy Technician Association. Take math and science high school classes. Understanding foundational skills and concepts will be helpful during training. Take a stand-alone online class such as Introduction to Pharmacy for an idea of what will be expected, or an advanced math class like Pharmaceutical Mathematics. Volunteer or intern in a pharmaceutical setting such as a community pharmacy, hospital, or health clinic. Gain related work experience to build skills necessary in the field. For instance, get a job as a cashier at a retail pharmacy to develop customer service skills. There are several licenses and certifications associated with pursuing a career as a pharmacy technician. Requirements vary by state, so anyone interested in becoming a pharmacy technician should check with their state’s licensing board. Many states require pharmacy technicians to earn and maintain certification. One certification agency is the Pharmacy Technician Certification Board. In addition to passing the initial exam, pharmacy technicians must pass a recertification exam every two years and earn 20 CPE hours for renewal in many states. The second certification agency for pharmacy technicians is the National Healthcareer Association (NHA). To earn CPhT certification from NHA, applicants must complete a training program or have a minimum of one year of experience working as a technician. The American College of Apothecaries Compounding (ACAT) offers optional compounding training for pharmacy technicians who want to advance their careers by learning advanced skills. Students who enjoy working in the healthcare field but prefer working directly with patients may choose to attend an online ultrasound technician school. These schools teach students how to operate special imaging equipment to create images and conduct diagnostic tests. For students with a passion for medicine who love animals, an online vet tech school may be the ideal path. Vet tech schools prepare students to perform medical tests to diagnose animal injuries and illnesses under the supervision of licensed veterinarians. Another option for students who want to work in healthcare is becoming a physical therapy assistant. Online physical therapy assistant programs instruct students how to help patients regain movement and manage pain while recovering from illnesses and injuries.